While this post is not about traveling to far off or exotic destinations, I decided to share this with everyone due to the display of interest and number of questions I have received on social media. Without further ado, here it is, a special post dedicated to the details of our travel theme wedding in Cincinnati! For my husband John and I, travel has always been a big element of our relationship. It is something very meaningful to us individually, as well as together as a couple. The decision to give our wedding a travel theme was based upon that, not just because “oh I like going on vacations too, what a cute idea!”. So if you are thinking about having a travel themed wedding, make sure that travel is an integral element of your life and relationship, and that the theme isn’t something you’ll regret in years to come. It might be “trendy” and cute for now, but make sure you won’t get sick of it in the future! I should first mention that putting this together was not easy, it took about 15 months of brainstorming, planning, collecting pieces, and staging displays. It all came together wonderfully, but it was not without a LOT of time and hard work. I will share some of the main travel elements and ideas that we incorporated into our big day, but also want to mention that the main thing you should do is make it about you as a couple. Don’t just copy or mimic something that you saw on Pinterest or in a magazine, because that doesn’t give it meaning or make it unique to you and your relationship. While it’s tempting to go crazy with all the ideas available to us today, you need to narrow it down and find your niche or overall style. Once you have that set, then the rest will come naturally! Part of our entry display, this piece was handmade by my husband. Each direction sign pointed to somewhere we had traveled to together, and I painted the names and distances onto each of the different arrows. While we did include some “exotic” locations, we also had direction signs for our hometowns, our future home together, our honeymoon and engagement locations, and where we first met. To acquire this display we went to many yard sales, borrowed from friends, and even found one of the trunks in a neighbor’s trash pile. I had envisioned a big entry display in my head, and these vintage finds (arranged artistically as they are) were the perfect welcome pieces. Instead of the traditional chicken and veggie dinner, we decided to do stations for our guests. We worked with our caterer to come up with three separate food stations, each based on a different country. We settled on Thailand, Mexico, and Italy- and it was delicious! I also bought little flags for each country and had them set up around the food lines, and we also made a poster with a map border detailing the options. In the back area of our reception, we had a seating chart displayed for our guests. I purchased a giant map, attached it to a large piece of foam-board for stability, and stood the map on a large photo stand. I then wrote guests names and table assignments on small luggage tags, and did my best to artistically tape these in a nice display over the map. We also had a framed sign next to the seating chart which stated “where in the world are you sitting?”, as well as some additional pieces such as our travel-themed guest book, etc. Once guests received their seating assignments, they headed to their table. Each table was named for a country that either I or my husband have been to, and the tables were identified with the corresponding name and number printed over a photo we had taken while there. I used small globe photo holders to hold up the number signs, which I made myself and then printed on glossy photo paper. This was easily the part of the decorations that took the most time, effort, and dedication. Each table was a little different, and I had to coordinate several different elements. Overall, we had vintage books, flowers in a variety of vases, and some sort of globe. Collecting these globes was a particularly daunting task given that we had 33 tables! Yard sales, craft shops, and home decoration stores were the main places we found most of these items, and I gathered all these pieces the week before the wedding to set up “mock” centerpieces arranged how I liked. I then photographed the setups, put the items all in separate bags, and assigned someone to set them up on the big day. I did this on several of the centerpiece and side table vases using map print scrapbook paper and mod-podge. While most of my adult life I had known I wanted my wedding colors to be blue, green and yellow, I didn’t realize that they would also blend in nicely with the color scheme of most globes! Coincidence? I had these scattered all over the place- they made their way into the flower vases, bar table, and attached to all of the signs I made with our wedding Instagram hashtag. This was made out of map paper, and made a great focal point above the seating chart. Although it was a bit tricky to tell that it was made from maps, at least I knew! I chose a map with colors that fit our wedding scheme, and had my friend who is a graphic designer create these beauties. In addition to the actual invitation, I printed off map paper at Kinko’s, and cut them into envelope liners so that each invitation had a beautiful map inlay. Remember to go for consistency! The programs were the same map and font that were on our invitations. Thank you for sharing this outstanding blog post about your wedding. I missed some of the details the night of the wedding and have thoroughly enjoyed reading your blog and looking at all of the photos showing your special touches. I can’t get over the “map” cake flowers and the pinwheels…how did I ever miss that?! In my humble opinion, you need to submit this post to a wedding magazine or some other publication. It was a fantastic wedding and one we will always remember. Your talents never cease to amaze me. Niceee! Some great & beautiful ideas here! Thanks for sharing, and congratulations on your wedding! I’m glad you had fun reading through this- and yes you should definitely convince your future husband! I have just discovered your blog thanks to Instagram (there I am @lilynufar), and I am so impressed by these gorgeous wedding pictures! I can’t imagine the time, dedication and effort it took, but the result is simply amazing. 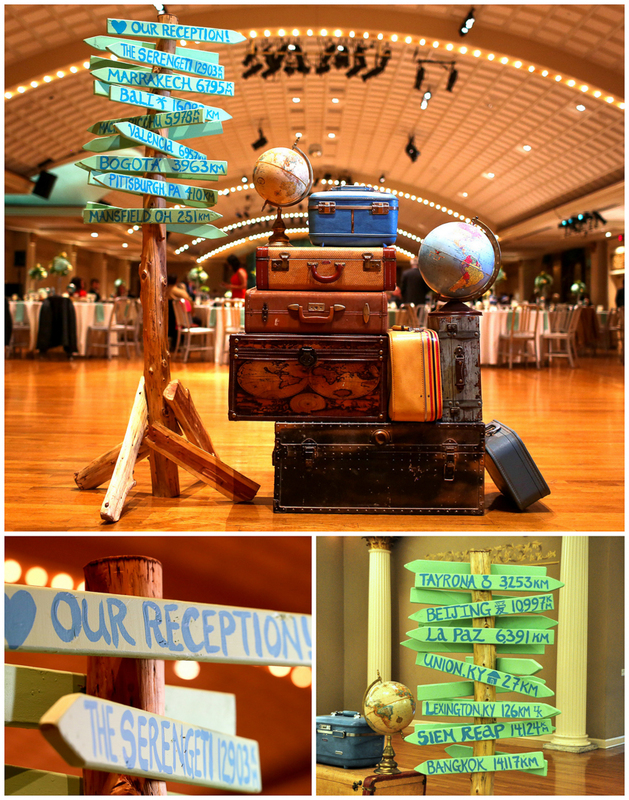 Congratulations on your wedding, wishing you a travel-filled happy ever after! Wow- those are some great compliments- thank you so much!! Thank you so much for sharing these wonderful pictures and ideas. I am planning a travel themed wedding as well and have been all over the place about what to include and how to tell our story through travel. Your tips have definitely help me narrow my vision and help me focus on our story not just travel. Such a fab wedding! Congratulations. Where did u get all the maps??? Thank you for sharing! Your wedding looks beautiful! I love the idea of the sign to point guests in which direction to go! You definitely have a good imagination and sense of decoration! Congratulations! Thank you so much!! I appreciate it 🙂 A lot of time and planning went into every detail! I absolutely love all you did for your special day! I really like your save the date and invitations. Where did you get your save the dates? Also, you mentioned that your friend is a graphic designer. Does he/she sell this suite on etsy or have a website? Hi Melissa- My friend designed these for me, but she does not have an etsy page (not sure why!). If you want to reach out to her via email for more information (you can mention that I referred you) her email is efschm01 at gmail ! I live in Sweden but my fiancée and I have traveled the World together! The flowers on the cake with the map, is it made out of paper or is it edible? A very nice detail! Hi Matilda! The flowers are made out of paper, so not edible unfortunately- but they did look nice! I found them on Etsy- let me know if you’d like the link! Congratulations to you and your fiancee!! I was wondering if your friend is willing to create other invitations. I have been on the lookout for “map” Invitations with no success or perfect fit. Please let me know! If not, the hunt continues!!! Hi Ashley- She does do occasional freelance design from time to time. You can email her at efschm01 at gmail if you want to try! If not, I know there are a few available on Etsy! You’re blog is just beautiful! Me and fiancee stumbled upon it looking for elements for our multinational wedding 🙂 I was wondering, if you could tell me which map you used in your invitation envelope liners? Hi Michael- I found the map print on Etsy- Shoot me an email at greatwidetravel at gmail and I can try to send you the link!! Congratulations on your engagement too!! Thank you for posting this. You litteraly posted my vision. My fiancé and I have traveled to over 10 countries and i can’t imagine a wedding without a travel them. This is CRAZY. I decided to choose “All Around the World” themes for my wedding and our names are Michelle & John too!!! AHHh no way!! That’s too funny! What’s your Instagram? We should be friends on there!